Whether you’re a track day enthusiast or aspiring racer, faith in your tires is of the utmost importance. For those with their sights set on lowering lap-times, Bridgestone aims to please with the new Bridgestone Battlax Racing R11 DOT race tire. Called a “grooved racing tire” by Bridgestone Moto USA, the Battlax Racing R11 is a single-compound tire designed to ridden at the extremes and meant to be paired with your favorite Supersport or Hypersport machine. For our purposes, Bridgestone partnered with Yamaha and hosted us at Utah Motorsports Campus (UMC) where we had the complete Yamaha 2018 Supersport model lineup at our disposal, which includes the YZF-R3, YZF-R6, YZF-R1, and YZF-R1M. With highs in the low 70s, we had the perfect situation for testing. Homologated tires fit in an incredibly important niche of sport riding, as these tires need to be DOT-approved to conform to racing regulations. Depending on the class you plan on racing in, you may be required to use a street-legal tire, which restricts you from using a top-level racing slick. To give racers what they need, and pass DOT regulations, the Battlax Racing R11 was created. Due to the sticky-soft compounds at play, Bridgestone strongly recommends that you use tire-warmers with R11s, especially when they’re freshly mounted. That initial 60-minute heat soak aims to promote proper tire wear and behavior, according to Bridgestone representatives. The “R” family of tires is not new to Bridgestone lineup, as the Battlax Racing R11 is the successor to the Battlax R10, which was introduced in 2012—a tire that I’ve used on a few occasions and was quite pleased with. However, the R10 was getting a bit long in the tooth and going up against the likes of the Pirelli Diablo Supercorsa SC line, Michelin Power Cup Evo, and the Dunlop GPA- Pro. With the current crop of motorcycles becoming more powerful and making greater demands on tires, it was time for Bridgestone to up the ante. The development of the Battlax Racing R11 marks several firsts for the brand. This is the first time that a grooved racing tire has been launched with a complete range of tire sizes, supporting motorcycles in the non-slick production-based 300cc, 600cc, and 1000cc racing classes. Additionally, it’s the first time that Bridgestone has employed its proprietary diagnostic technology dubbed Ultimate Eye for a DOT race tire. Essentially, Ultimate Eye is a tool that allows engineers to analyze the weaknesses and strengths of a particular tire while under load, allowing engineers to refine the tires. This technology was developed during Bridgestone’s years with MotoGP and engineers are employing some of what they learned from the top level of motorcycle racing in the R11. In many ways, the Battlax Racing R11 can be seen as a major evolutionary step for the R series. It has been imbued with a new compound, new internal construction, and optimized groove positioning. Importantly, the R11 isn’t a huge departure from what fans of the R10 have come to know in regards to its profile. One of the goals with the Bridgestone Battlax Racing R11 was to improve the performance on the edge of the tire, whether that is on entry, mid-corner or exit. Some of that was achieved through their new Variable-Mono Spiral Belt (VMSB) construction. While mono spiral belts are not new for Bridgestone, the variable aspect of that technology is. The spiral belt is more densely packed in the center of the tire. When moving towards the shoulders, the Variable-Mono Spiral Belt’s gap begins to increase, allowing more flexibility and contact patch conformity while at lean. The spiral belt itself has gone through some revisions as well, helping complete the package in that sense. The internal structure of the High Tensile Super Penetrated Cord (HTSPC) has been spaced out. This allows for more flexibility and makes for a more uniform contact patch, as shown during testing with their Ultimate Eye diagnostic software. We spent the first day aboard a stock 2018 Yamaha YZF-R3, attacking the East Track at UMC. The course a close-quarters, dynamic circuit that offers a little bit of everything—high speed sweepers, ascending corners, hairpins and a downhill chicane to round out the fun. In the case of the Yamaha R3, the new Bridgestone R11 is undeniably transformative. We pulled off the tire warmers with 32 psi in the front and 23 psi in the rear. Ideally, you’ll see 2-3 psi of growth when getting off track. That’s also the Bridgestone pressure recommendation for all R11 tires when using tire warmers, regardless of size. After a sighting lap or two in the brisk Utah morning, we began to become comfortable with the circuit, hurling ourselves into corners. An aspect of this tire that immediately stood out was the confidence in the front end, especially when trail-braking and tipping into the turn. As these were stock motorcycles, the suspension is on the softer side and non-adjustable, save for spring-preload on the shock. It forces riders to focus on loading the tires correctly before diving for your apex. If you want to have serious fun on a motorcycle, there is nothing like a little bike with good tires. 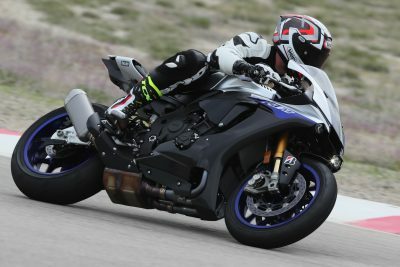 Even when using most of what the Yamaha R3 suspension has to offer, the new R11 felt completely planted and continued to hold true. Tipping in is fast, but controlled, making for a precision experience with the front end. Perhaps its most noticeable characteristic is how easily it was to correct a line, even when at significant lean. If I misjudged my entry and needed to lift, I didn’t feel uneasy correcting my line, despite how brilliantly effortless it was. These attributes go well beyond inspiring confidence and easily start crossing the line into arrogance. Your only limitations are going to be in the skill-level department and how much lean angle ground clearance you can nurse out of the YZF-R3. Lower footpegs means more comfort, but you’re more likely to find hard parts. The rear tire has been bestowed with the same V-MSB and HTSPC updates. In addition, it’s equipped with a GP Belt – a bit of tech pulled straight out of bag of tricks Bridgestone amassed while being the spec tire producer for MotoGP. It’s designed to help with the forces tires go through when under hard acceleration and increase overall stability. When getting to the apex, whacking the throttle open doesn’t result in anything but a total amount of confidence in terms of grip. At that point, it’s a game as to how long you can stay at full throttle, because the tires certainly aren’t giving out. Bikes such as the R3 can still certainly highside you, should you push it too much while on the edge of the tire. Fortunately, the likelihood is dramatically reduced since we’re dealing with lesser horsepower and torque figures. Another improvement Bridgestone engineers made to the Battlax Racing R11 is in regards to the 3D grooves. To ensure that riders will be getting the absolute most out of their tires, the grooving has been designed to handle the lateral forces exerted on a tire when at lean. When you’re entering, mid, or exiting a corner, the forces will be distributed across the groves and allows a wider span of rubber to be utilized. Engineers also claimed that this helped alleviate excess deformation, improving the effectiveness of the contact patch and improving tire wear. Tire wear was good on the track, as the Yamaha R3 isn’t particularly demanding in that regard. Without adjustable suspension, we simply had to live with the consequences, though the Bridgestone R11 tires looked to be ready for more when we spent a full track days’ worth of time on them. The performance of the YZF-R3 was just a taste of what the new R11 offers. When we moved to the West Track and began pushing the YZF-R6, YZF-R1, and YZF-R1M, my feelings were solidified. Getting heat into the tires isn’t as issue, and the new R11 seems to come up come up to temperature much faster than its predecessor. In some of my more foolhardy and later sessions, I’d run out on track and be roughly pushing up to my pace within a few turns without any cause for alarm. Once again, the front impressed when first headed out on the 2018 Yamaha YZF-R6. Snapping into corners wasn’t met with a single bit of resistance. Now that we were constantly carrying higher speeds when trailing braking and slowing upon entry, that put far more stress on the front. In heavy braking zones, the Bridgestone R11 tires remained completely stable even if I got a bit too aggressive with my downshifting. With non-racing street tires, I would have certainly felt more instability through the chassis, but the R11s remain remarkably stable. Driving out of the corners was equally as impressive, allowing me to become greedier with the throttle. At virtually no point did I feel signs that it was going to let loose and had great drive, even when coming out of slow hairpin turns on the R6. Supersport 600s require a riding style that rewards sweeping lines and high corner-speed, and at no point did I lose any confidence while on the shoulder. Bumpy portions of track are always unsettling. Typically, you’ll want to find a line without them. Of course, there are usually a handful of turns where it simply isn’t possible. On the exit of the Diablo and Precision corners on the UMC West Track, there are a few harsh bumps that normally would make me check-up. By the first half of my session, I stopped paying mind to them and focused on technique, as my faith in the tires was undeterred. Lap after lap, it felt exactly the same—planted, even with some abuse to the left side of the tire. The West Track at UMC is heavily biased for left-hand turns and more wear to that side of the tire was to be expected. Impressively, the profile remained unscathed. However, this seemed to only be most prominent on my machine and I was seeing about a 10-degree difference from the left to the right side of the tire. This highlights one crucial point about race tires—you must dial your suspension to get the most out of your rubber. I’m sure the rear would have survived on the R6 all day, but this is yet another helpful reminder to set your suspension up. The true test of the Bridgestone R11 is with the monstrous 2018 Yamaha YZF-R1 and YZF-R1M superbikes. The consistency of performance between each motorcycle is downright astounding. Virtually every positive attribute I felt on the R3 and R6 directly translated to the liter bikes for someone of my pace. Coming into turn one—Sunset Bend—had me putting a lot of faith into the front, as I would routinely be coming down from triple digit speeds, and then spending an extraordinarily long time on the edge of the tire. That corner also has a noticeable bump on the inside line that fazed me less and less as the day grew on, thanks to the growing confidence I had in the R11. Grip on the exit is massive and allows you to roll on the throttle with urgency. Once again, the feedback was highlighted in spades. A bit of spinning could be felt when whacking the throttle on the beastly Yamaha R1 and R1M open in excruciatingly slow sections, but the Bridgestone R11’s give extremely gradual feedback and didn’t create any cause for alarm. A bit of wheelspin on a liter bike is natural to the class of machine, as any modern Superbike is asking the world of any tire. What stands out to me is how comfortable and predictable the new R11 is. It allows for aggressive, agile riding. At the same time, it doesn’t bite the hand that feeds and makes for great adjustments, even leaned over, regardless of the size of motorcycle you are on. Tire wear on the liter bikes was even, which is impressive because we were now dealing with 160+ horsepower at the rear wheel. Superbikes tend to be abusive to rear tires, as they encourage a more point-and-shoot riding style that leans on the bike’s brutal acceleration. We ran nearly a full track days’ worth of riding on a single set of tires and I’d have been perfectly fine continuing. MSPR for the Bridgestone Battlax Racing R11 is around $230 for a 200mm rear and $130 for a front. For fine-tuning to your needs, Soft and Medium compounds are available. In nearly every situation, the Bridgestone Battlax Racing R11 performed just as I’d want it to and left plenty of performance on the table for speedier riders. Unequivocally, the new R11 is an improvement over the R10 it replaces.